Summary: A lyrical novel about family and friendship from critically acclaimed author Benjamin Alire Saenz. Review: Let me start out by saying this: I was absolutely in love with this book. The characters were just so phenomenal, Ari's voice was completely real and authentic. The pacing was perfect and the writing was beautiful... from chapter one I was hooked. I wasn't so concerned with where the story was headed or where it would end because of how beautifully crafted the story was. 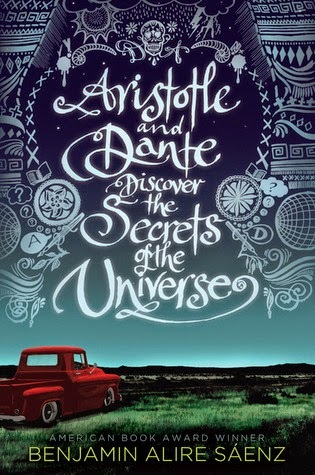 I enjoyed each and every moment of Aristotle & Dante. Aristotle is a fifteen-year-old Mexican teenager raised in El Paso, Texas in 1987. It is when he is fifteen that he meets a boy that will inevitably change his life, Dante. There are not many books that I can say that I've read lately that have such incredible characters. Maybe a shining character or two, but I just felt like as a whole the "cast" of this book was so well-rounded and likable. Ari's voice was real and you could understand the struggles that he is working through and he's been struggling through for quite some time. He has an older brother who has been in prison, the thing is- he has been for years and Ari is not allowed to talk about his brother. His parents don't mention him and there is a lot of anger and question with his brother having been sent away and the stigma that it's left in their household for Ari to deal with. Contemporary books with a focal point on friendship that are authentic and real are hard to come by. I can't remember the last time that I read a book about the friendship of two boys. And honestly if I had I doubt that it could compete with Ari's story. There are several subplots within the book, but I think that what I enjoyed the most was Ari discovering who he was, how his brother's choices affected him as a person. And how to deal with the changes that inevitably happen in your teenage years. If you are looking for a poignant contemporary read, I highly recommend you check this one out!